County Sanitation District of Los Angeles County (Sanitation District) owns the Mesquite Intermodal Facility (Intermodal Facility) in Imperial County. Completed in 2011, the Intermodal Facility is adjacent to the dormant Mesquite Regional Landfill (Landfill). The Landfill has not yet received any waste but is standing by to serve the future solid waste needs of Los Angeles County with a permitted capacity of 20,000 tons per day. Until this peak capacity is reached, the Sanitation District believes the Intermodal Facility can be used for import and export of other commodities. The Sanitation District is seeking Expressions of Interest for operating or leasing the Intermodal Facility for other intermodal uses and the transport of various commodities. Responses that include viable options to effectively utilize the facility and produce revenue for the Sanitation District will be considered. The Sanitation District will use Expressions of Interest as the basis to evaluate potential revenue-producing uses of the Intermodal Facility, and to determine the potential users, tenants, or operators with whom the Sanitation District may enter into negotiations. This is not an offer to lease, possess, or operate, or utilize the Intermodal Facility or any other property. Any lease, use/operating agreement, or other agreement may be contingent on compliance with the California Environmental Quality Act and other applicable laws, regulations, codes, and ordinances. A private, 4.5 mile rail spur from UPRR’s Sunset Line to the Intermodal Facility. The rail spur is located on a 200-foot wide Right-of-Way granted by the Bureau of Land Management. Additional acreage available for warehousing, container storage and minor onsite processing activities. The Sanitation District is a public agency created under State law to manage wastewater and solid waste on a regional scale. The Sanitation District is headquartered in Whittier, CA and jointly shares staff for providing these services. The agency currently serves about 5.6 million people in Los Angeles County. 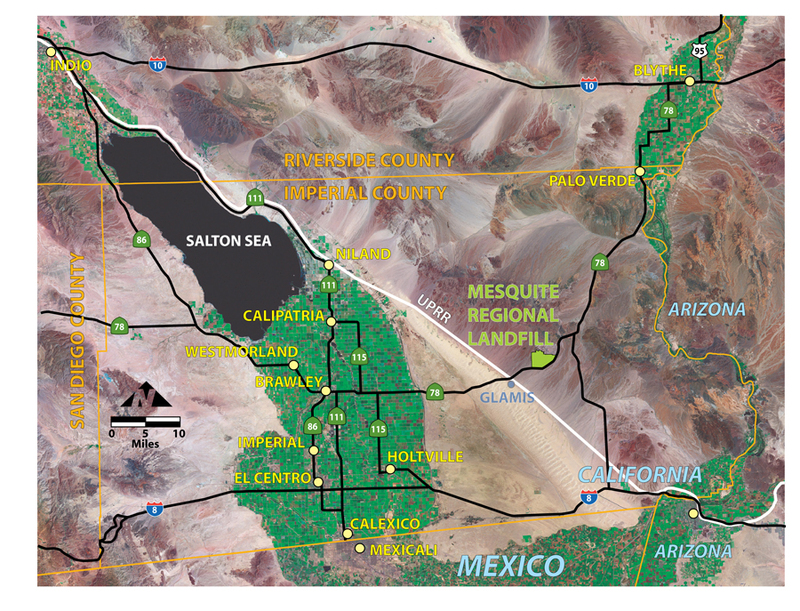 The service area covers approximately 850 square miles and encompasses 78 cities and unincorporated territories within the county. The Sanitation District has been a leader in providing wastewater and solid waste management services to the region since the first district formation in 1923. Today, the wastewater system includes approximately 1,400 miles of main trunk sewers, 50 pumping plants, and 11 treatment plants that transport and treat about half of the wastewater in Los Angeles County. The Sanitation District’s comprehensive Solid Waste Management system includes the operation and/or ownership of two active sanitary landfills, four closed landfills, two landfill gas-to-energy facilities, three materials recovery/transfer facilities, and two refuse-to-energy facilities. More information about the Sanitation District is available at its website at www.lacsd.org . A fact sheet about the Sanitation District is available at http://www.lacsd.org/civicax/filebank/blobdload.aspx?blobid=8695 . Construction of the Landfill and Intermodal Facility began in 2006 and was completed in 2011. As a result of the economic recession in 2008 and increased recycling in California, the amount of waste requiring disposal has significantly gone down since the completion of these facilities. In addition, a surplus of landfill capacity in and around Los Angeles County has created a very competitive market for waste disposal in the region. As a result, it is not economical to open the Landfill to begin operation of the Sanitation District’s waste by rail system. More information about the Landfill and Intermodal Facility project can be found at www.mrlf.org . Until the waste by rail system is operating at full capacity, the Sanitation District is considering making the infrastructure at the Intermodal Facility available to other users for transport of commodities. UPRR will deliver trains of commodities onto the spur, but UPRR is not permitted to enter the Intermodal Facility. Therefore, a certified locomotive engineer that is qualified to operate a train with distributed power must move the trains into the Intermodal Facility from the rail spur. Conversely, prior to departure, the locomotive engineer must move the train from the loading strip tracks onto the rail spur for pick up by UPRR. An operator of the Intermodal Facility will transfer intermodal containers or bulk commodities between trains and trucks. For any combination of items a through c above. This Request for Expressions of Interest will help the Sanitation District focus on these possibilities for the Intermodal Facility. Interested parties should express their interest including commodities and clients in the response. The Sanitation District is interested in any proposal for a minimum five year term. This Request for Expressions of Interest and any responses to this request are for discussion purposes only. This is not an offer to sell any product or service, and does not constitute a commitment on the part of the Sanitation District to enter into any transaction, agreement, document, or instrument. Likewise, a response from the Sanitation District or any discussion with the Sanitation District will not be considered a binding offer or acceptance to purchase or lease or to enter into any transaction, agreement, document, or instrument with the Sanitation District. No agreement, document or instrument is binding upon the Sanitation District unless and until it has been executed and delivered by the Sanitation District’s Board of Directors and countersigned by the other party. Neither the Sanitation District nor any party responding to this Request for Expressions of Interest will be obligated to enter into a transaction or definitive agreement with the other party and each party may cease discussions for any or no reason at any time. Additional facility information is available upon request from Mark Revilla at mrevilla@lacsd.org or 562-908-4288 extension 6013. Site visits can be arranged (at the sole option of the District) if requested. Interested parties should provide the Sanitation District with written Expressions of Interest that address any or all of the items identified in Section 6.